Anyone who knows me will recognize how big an accomplishment that is. 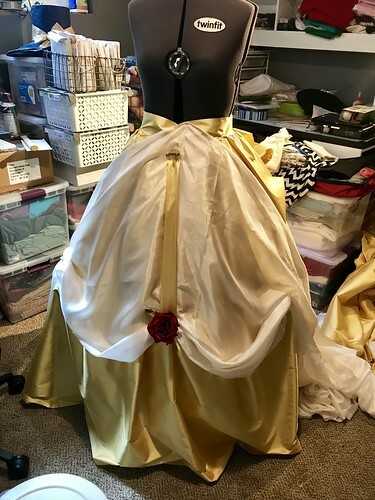 Now, in the original post, I mentioned that I intended to make a new cage crinoline. 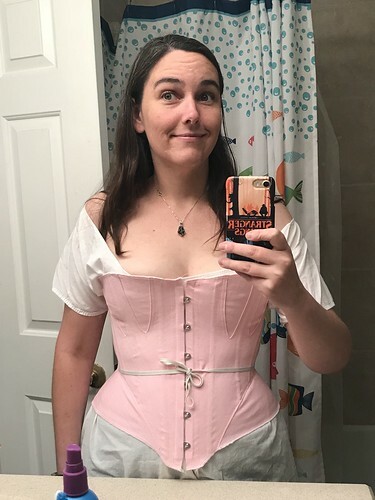 That didn't happen, but the corset made from a Redthreaded pattern did. 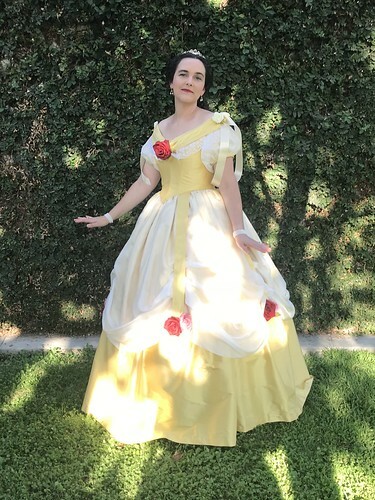 I started the gown on July 14, 2018 and I wore it to the Gala on July 28, 2018. And actually, I'm very proud of its construction. Let's dive in. 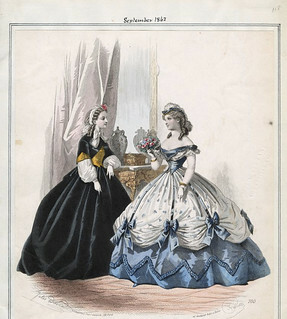 I started by creating a Pinterest board for the project and then narrowing it down to these two fashion plates as my main inspiration. 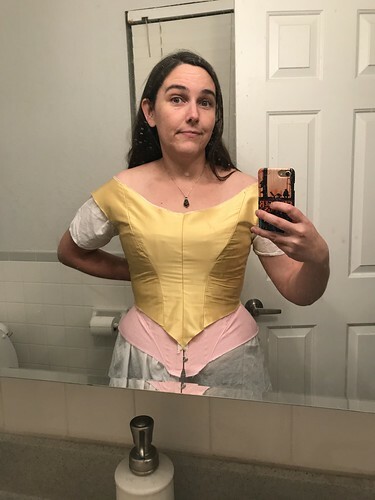 Since I was still futzing around with a corset, I started with the skirt. 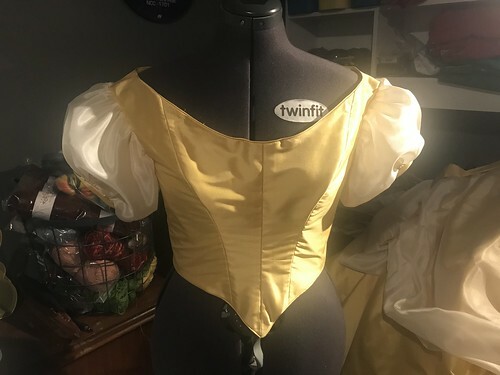 It's three widths of yellow silk taffeta that I ended up cartridge pleating to the waistband. 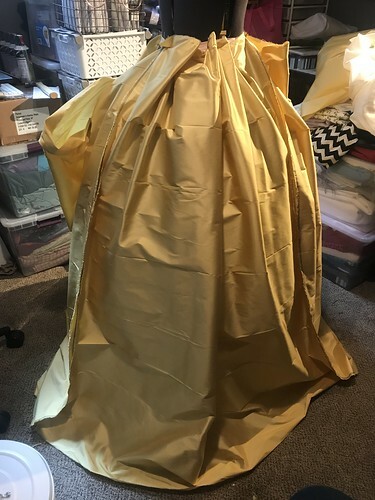 I originally planned to box pleat it and do the yellow taffeta swags, but I had a length of semi-sheer china silk that I really loved as an overlay. 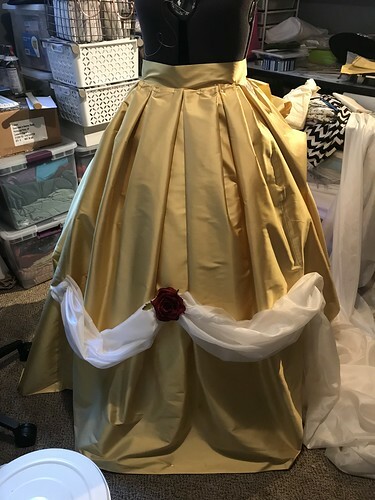 I ended up pleating the taffeta and china silk together. 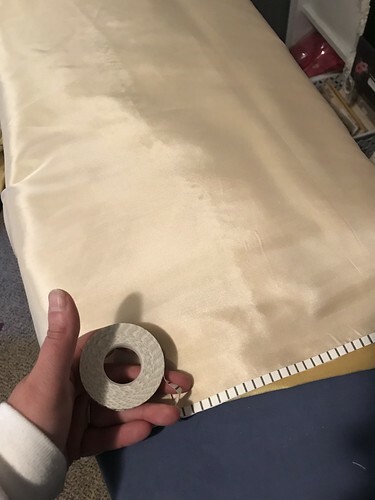 Oh, and quilter's tape is the actual best when it comes to cartridge pleating. Perfect spacing every time! 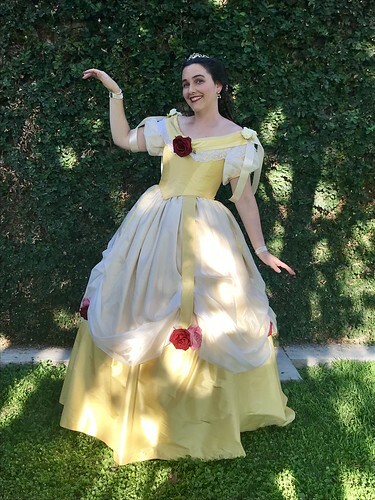 The bodice came next and I used my trusty ballgown bodice pattern, last seen in the Huge Pink Ballgown. 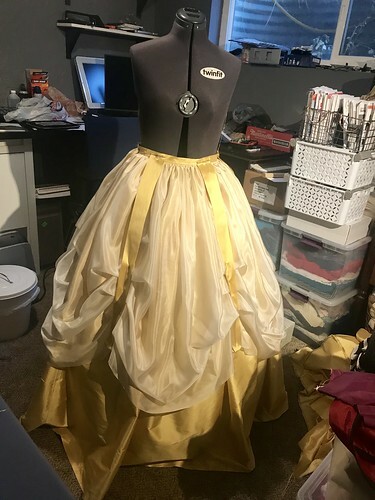 This made fitting super easy and I almost hated to cover it up. 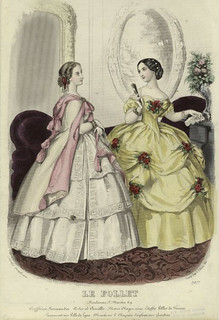 The sleeves are two layers: a yellow silk rectangle and a slightly larger china silk rectangle. Both are gathered to a band at the bottom, then gathered into the armscye. Easy, fast, and pretty! 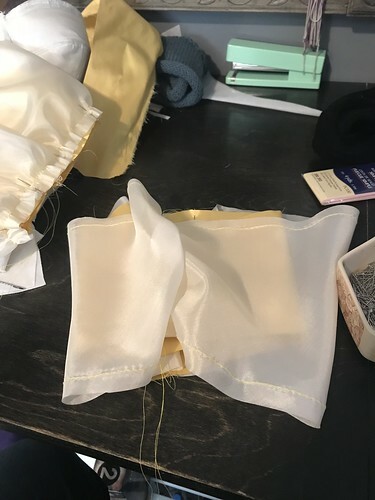 I dithered a lot with the bertha and finally decided on pleated yellow silk accented with flowers and ribbons. 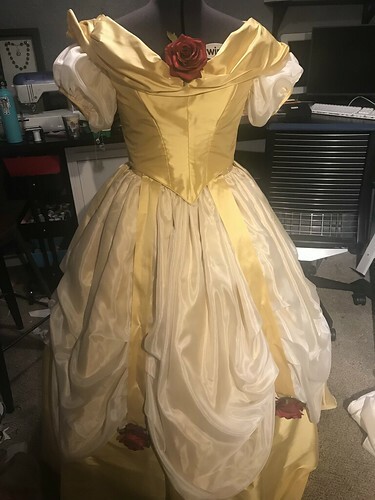 That was finished at Costume College so no in-progress pictures. 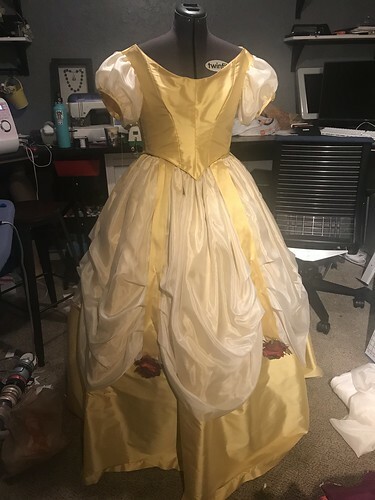 The gown laces closed at the back and I crowd sourced the eyelets so they're my favorite part really. 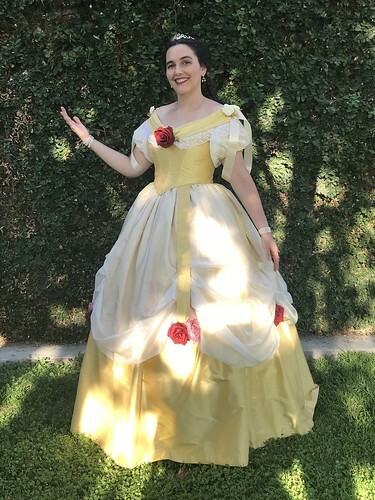 The bodice and the skirt are sewn together so there are no gaps and voila: The Belle Gown of my dreams! 10 year old me is crying with joy. 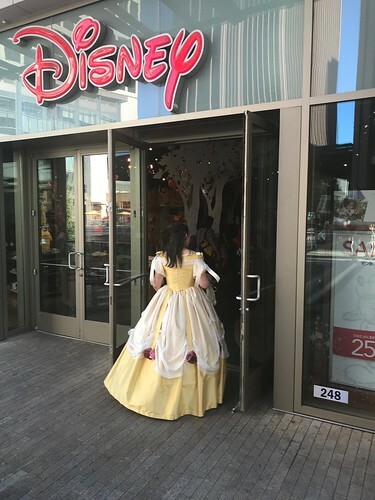 Oh, and last but not least, I wore the gown again for Salt Lake FanX (formerly Salt Lake Comic Con) this year and since the convention center is right next to a mall, I had to make a quick side trip. So there you have it. From non-existent to fabulous in two weeks!